EPIC JOURNEY: "Mr. Speaker, I have changed my mind." 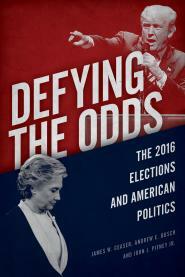 In Defying the Odds, we talk about the political impact of economic policy. On November 17, 2011, Representative David Dreier (R-CA) explained why he had abandoned his support for a balanced-budget amendment to the Constitution. Mr. DREIER. Mr. Speaker, I want to begin by expressing my appreciation to both of my friends from Florida who serve on the Rules Committee. This is a very, very important debate. It's a debate that we haven't had since January of 1995, which is the last time that the House of Representatives had a vote on the issue of a balanced budget amendment to the U.S. Constitution. Back in 1995, when we had just won our majority, Mr. Speaker, I was one of the enthusiastic supporters, one of the two-thirds of the House of Representatives who voted in favor of the constitutional amendment requiring a balanced budget. I felt very strongly at the time that as we looked at the fiscal challenges that we as a Nation faced that the only thing that we could do to achieve a balanced budget would be to have an amendment to the U.S. Constitution that would call for that. Mr. Speaker, I have changed my mind. I have changed my mind, and I will be voting against the constitutional amendment calling for a balanced budget. Now, this is not something that I have done lightly. My friend from Spring Hill was absolutely right when he said that looking at the tough challenge of amending the Constitution is something that needs to be addressed; but I will say that I agree with a number of the arguments that were put forward by my friend from Fort Lauderdale and with a lot of the arguments put forward by my friend from Spring Hill. At the end of the day, I concluded that we should not amend the U.S. Constitution in calling for a balanced budget. I said I've changed my mind, and I am reminded of a statement that was made by our former colleague, the mentor of our friend Jeb Hensarling, who is working tirelessly to ensure that we get our fiscal house in order with the work of the Joint Select Committee. His mentor was Phil Gramm-a Democrat, then a Republican-who served in the House and the Senate. Phil Gramm once said that ours is one job where you can never admit to having learned anything. Mr. Speaker, I believe that I've learned something, and I'd like to take just a few minutes to explain why it is that I've come to the conclusion that I have. I said at the outset that I believed when I cast that vote in January of 1995 in favor of a balanced budget amendment to the Constitution that it was the only way that we would be able to achieve a balanced budget. I was wrong. Two short years later, we balanced the Federal budget. We balanced the Federal budget, and that went on for several years. It went on until 2001. My friend was talking about the fact that we had two wars. We've got to remember that it took literally billions and billions of dollars to deal with national security issues, like establishing the Department of Homeland Security and many other things that were very, very costly; but what I found, Mr. Speaker, is that we were able to balance the Federal budget without touching that inspired document, the U.S. Constitution. Now, James Madison in Federalist No. 58, I believe, gave the real description of the power that lies here in the House of Representatives. He said that the power over the purse is the most complete and effectual weapon that can empower any group of elected representatives of the people. We in this institution, Mr. Speaker, have the power of the purse. We have the power of the purse, and we proved in the late 1990s that we have the will to balance the Federal budget without touching that inspired document, the U.S. Constitution. Those were the words of James Madison in Federalist No. 58, that the power over the purse is the most complete and effectual weapon that elected representatives have. Now some people point to Thomas Jefferson who famously, in a letter to John Taylor written November 26, 1798, talked about how it was essential for us to have a single amendment to the Constitution that would call for a balanced budget. Well, I've got to say, Mr. Speaker, it appears that Thomas Jefferson obviously learned something as well, because 5 short years later, in the third year of the first term of his Presidency, he embarked on the largest deficit expenditure to take place since the Revolutionary War. It was not a war expenditure. It was not any kind of emergency expenditure. It was the 1803 Louisiana Purchase. And that was a decision that Thomas Jefferson made that most of us inferred led to a change in his position from the November 1798 letter that he wrote to John Taylor. As we look at some of the other arguments-my friend from Fort Lauderdale went through the Fried, Barr, Archibald, Bork arguments on the court. I think it's important for us to look at not just that part of it, but we also need to look at the enumerated powers provision in the U.S. Constitution. I believe that not only could we create, as these brilliant jurists said, a real problem within the court structure, but what we create is a transfer of power from the first branch to the third branch of government, something that is completely contrary to Article I, section 7 of the U.S. Constitution, where the power lies right here in the United States House of Representatives. Why? Because most have said that if we were to get into these protracted legal battles, this could end up in the court, and we could have, several years from now, a court deliberating over a budget that had passed, again, literally years before. So, as we look at these arguments, Mr. Speaker, I will tell you that I will take a backseat to no one when it comes to our commitment to get our fiscal house in order. I do happen to believe that our former colleague Jack Kemp was right when he said we shouldn't have to worship at the altar of a balanced budget; but we all know that with this $15 trillion figure that my friend from Spring Hill pointed to, we need to do everything we can to reduce that debt and our annual deficit. But it's important for us to focus on economic growth. And that's why I congratulate those on the Joint Select Committee who are working on that, and I believe that that's something that we need to do. But having a balanced budget does not guarantee job creation and economic growth. Yes, of course having a degree of fiscal solvency goes a long way towards generating a climate that can make that happen; but we need to have pro-growth economic policies, and fiscal restraint is only one of those tools. That's why I believe that, as we look at the challenges that lie ahead, I don't want to say to the American people that I'm going to protect you from your future leaders that you are going to elect. The American people deserve the Congress that they elect. I personally think they deserve better than some of what we have had here over the past several years. Right now we all know we've got a 9 percent approval rating. But the American people cannot have Representatives who say, We are going to say to you that you can't have the leaders that you elect do what you think is right. Maybe there is another Louisiana Purchase out there, and that decision is something that should be made by leaders. I believe in very carefully amending the Constitution. And I will say that I have always been troubled by some who argue that the level of your commitment to a public policy issue is based only on your willingness to amend the Constitution to implement it. Well, I think that's silly. I think that's ridiculous. I think that someone can be passionately committed to an issue like saying we shouldn't burn the American flag and yet be willing to say it shouldn't be enshrined in the U.S. Constitution. I feel the same way about the issue of a balanced budget. I'm proud to have voted to bring about these kinds of spending cuts. I'm proud to have done everything possible to try to reduce the size and scope and reach of the Federal Government. I do think that a lot of work has to be done. And my friend from Spring Hill, again, correctly pointed to the fact that both sides have responsibility for increases in spending. But I think we can come together. I think we can have the will to do this. Even if we pass a balanced budget amendment to the Constitution, we all know very well we're not going to balance the budget overnight with a $15 trillion debt and now multitrillion-dollar deficits. We're not going to do it overnight. But we have to get ourselves on that road, and I'm convinced that we can. And I don't think that amending the Constitution is going to do anything to help us get there. So I do support the rule, and I think the rule-by the way, I should say to my friend-is one that was used when the Equal Rights Amendment passed the House of Representatives. The argument was made that somehow having this done under suspension of the rules is not fair. There's going to be 5 hours of debate. There's going to be an opportunity to do this. I've had the opportunity to say my peace. I know that I'm in the minority in my party. I know that there's not a lot of enthusiastic support on my side. I know that there are many Democrats who are going to be supporting the amendment to this. So we are going to have a chance to discuss these as we move through today and tomorrow. I do support the rule and the work of the Rules Committee. We've worked long and hard on this. But at the end of the day, I have come to the conclusion that I have. With that, Mr. Speaker, I thank my friend for yielding.